Notre Dame loses to Virginia, plays "discouraged"
SOUTH BEND – Notre Dame wants to eventually get to where Virginia is right now. What Saturday's matchup demonstrated was just how far the Irish are from achieving that goal. 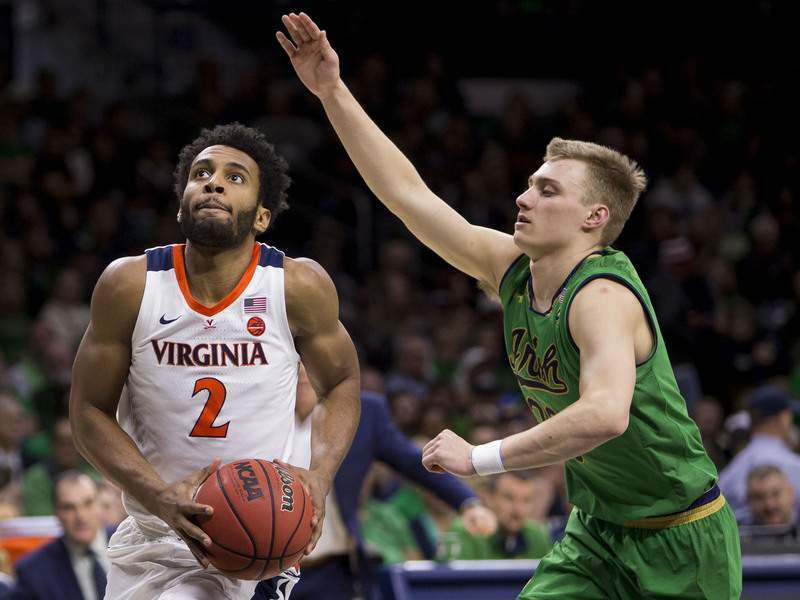 The 82-55 loss was not only a blowout, it was essentially non-competitive, more of a pickup game for the Cavaliers except for a few minutes early in the second half when the Irish made a brief run. "We're not in Virginia's league right now," coach Mike Brey said. "We're not. They have won together. We've had rotations like that in our program with guys like that. We aren't in one of those right now. We're trying to build that. But yet I still think we could have been more competitive at times." Brey called the matchup "men versus boys" and that's what it resembled at times. Notre Dame made a flurry of 3-pointers late in the first half and early in the second half that kept the game close for a while, but it was almost completely unable to get the ball to the rim and eventually the shots stopped falling. The Irish missed their final nine 3-pointers and shot 28 percent from beyond the arc overall. The gulf between the teams is vast and it probably won't close much by the end of the season. The Irish are in building mode right now and they're trying to create the kind of chemistry that Virginia showed. The Cavaliers are a team in every sense of the word, moving as one on defense and running efficient offense for 40 minutes. Brey thinks Virginia can win the national championship and his views are probably in the majority on that question. Still, Brey thinks the Irish have a chance to learn and grow from this loss. He doesn't want to count this season as lost while it's still January. "We don't want to give up on this year yet, even though we're in a heck of a hole, we get that," Brey said. "We were in a heck of a hole last year and we made a little move in February and made it interesting. "But I think big picture sometimes too and as we're trying to figure this group out and they'll all come back next year. It's a process with this group. I get it." In falling behind 42-25 at halftime, the Irish were also able to see first-hand how much Indianapolis native Kyle Guy has improved since the first time he played in his home state, as a freshman in 2016-17. In that game, the 2016 Indiana Mr. Basketball scored five points in 11 minutes and got swatted by Bonzie Colson, who turned to the crowd and yelled "It's my house!" It was Guy's house in the first half today. The Virginia guard scored 15 points on 6-of-7 shooting in the first 20 minutes and made three 3-pointers and a tough step-back jumper. He had a significant rooting section in one corner of Purcell Pavilion and it had more chances to cheer than the rest of the Notre Dame crowd did. "All those people watching him since he's been a grade school, junior high player, high school, college, they watched him do what he did today: shoot that ball," coach Tony Bennett said. "Beautiful stroke, quick release. He's such a great ambassador for our program. I love it when a guy can come home and there's a lot of family and friends to watch him." So, the Irish fell well short in their first of two matchups against the ACC's elite. Monday, they get another chance when they welcome No. 2 Duke to Purcell Pavilion. Brey wants them to practice hard tomorrow and he expects his team to come out with more energy than it did today. "I think they'll bounce back really well," he said. "I have a feeling we'll practice really well."